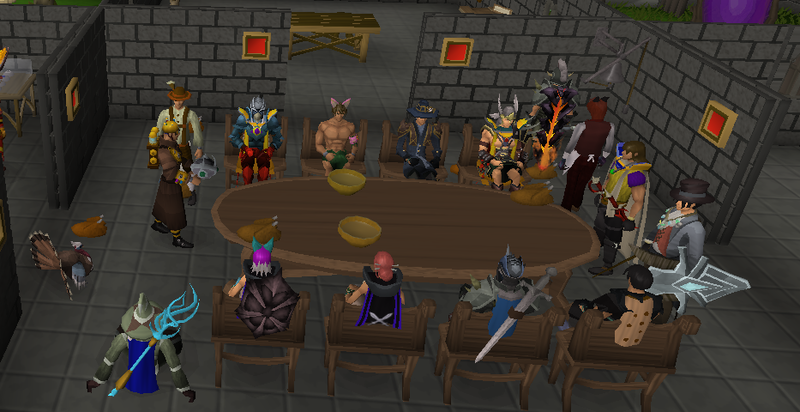 To start, I think that Jagex has made a very good job with clans, if we compare it to old ones (Friends Chat now). But I think that there are some slight good updates, that could be included into RuneScape 3 to make clans look better. This idea has been going around since Jagex introduced clans. To make clans keep the medieval-way, should be a good idea that an armour could be coloured. The Clan Uniforms could be worn at SGS's customization (of course, that these wouldn't be bought), or an aura that could be open for F2P's and P2P's, called Clan Aura, that, when worn, could make the actual armour have the clan colours, or another design that the clan leader would create. The clan uniforms WOULD NOT BE AN ITEM. That way, people could use their uniforms without taking off their armour, and, for example, at combat activities, they could still have their combat bonuses. The Clan Uniform could be different for each rank, if the clan wants it to be that way. It would be good also that there was an option to modify a specific clanmate's uniform. For example, to distinguish a combat leader from other clanmate, that could have the same rank. Even the leader as well could customize his/her own uniform. This could be an useful tool for clan leaders. Activity checks could help the clan in an important way: how to distinguish an active clanmate from an inactive one. This could inform the clan leaders and their trusted ones which clanmates are active, and it would be their choice to kick them or not. This could make Clan Battles much more fun and better. My idea of a better Rated Clan War is that Castle Wars, Mobilising Armies and other minigames qualities could be put together at Clan Wars. For example; Borrowing the Castle-assault and Capture the Flag quality from Castle Wars and taking the Base-Assault quality from Mobilising Armies. Another point is that the combatants could choose scenario and rules. - Siege: Taking some qualities from Mobilising Armies, this scenario could be based on assaulting the enemy's base. Artillery (cannons, rock-throwers, catapults, etc.) could be used to destroy the enemy's castle walls and therefore destroying the enemy's base. - Capture the Flag: The scenario could be similar to Siege's, but this wouldn't be a base-assault scenario, but as the name says, would be capture the flag. This would take Castle War's main quality; Capturing Flags. - Open Field: This scenario would be the same that there is now at Rated Clan Wars. Just as normal Clan Wars, the combatants could choose if there is a time limit, or there is none. To finish this point, at Siege scenario, there could be workshops at the battlefields, where artillery would be created. This could help at clans that want to be allies, they wouldn't just say "we're allies". When clans want to ally, they could go to the Scribe (or any other NPC) and tell that they want to form an alliance. You need to Buy Runescape Gold.There would be something that recognizes them, not just the words "we're allies".